Quebec has always been hugely inspiring for shutterbugs hankering after gloat-worthy shots (in fact, taking a bad picture here is virtually impossible). We visit ten of the iconic places that make this epic province one of Canada’s most photogenic. Of the 4,500 rivers spread across Quebec’s three geological sections (the Canadian Shield, the St. Lawrence River Valley, and the Appalachian region), the 1,200-kilometre-long St. Lawrence River takes centre stage. Known to locals simply as La Fleuve, its island-studded waters are not only crucial to the province’s hydrographical landscape (they make up 40 per cent of the renewable fresh water), but they also act as the main gateway to the Great Lakes and the North American heartland. For many, the pale-grey waters of this hauntingly beautiful waterway are best captured on film by hopping aboard a ferry boat or cruise ship - or by taking a flight-seeing helicopter tour (the latter is far more exciting than anything you’ll ever do in a motor boat). 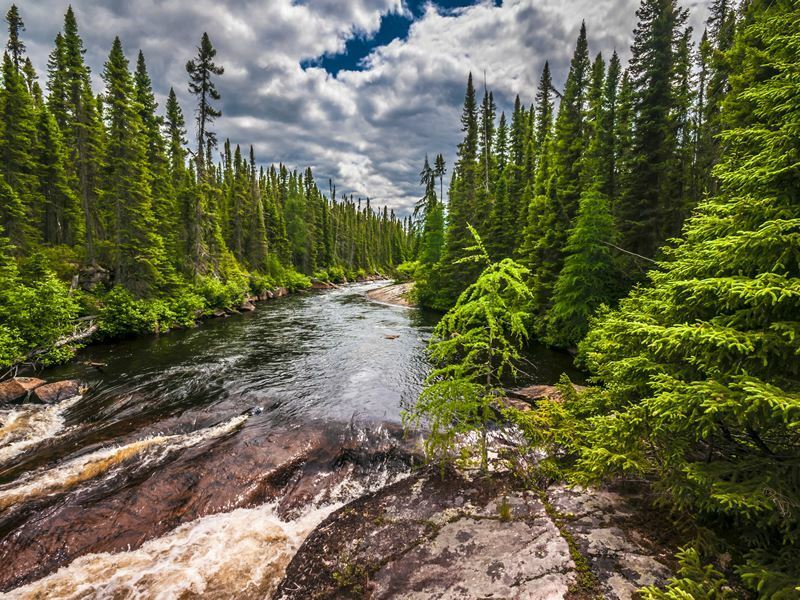 Get the shot: The gorgeous Parc National des Grands-Jardins (translating as Grand Gardens) at the core of Charlevoix’s UNESO-listed Biosphere Reserve rewards with some incredible shots of St. Lawrence’s River’s northern shore. 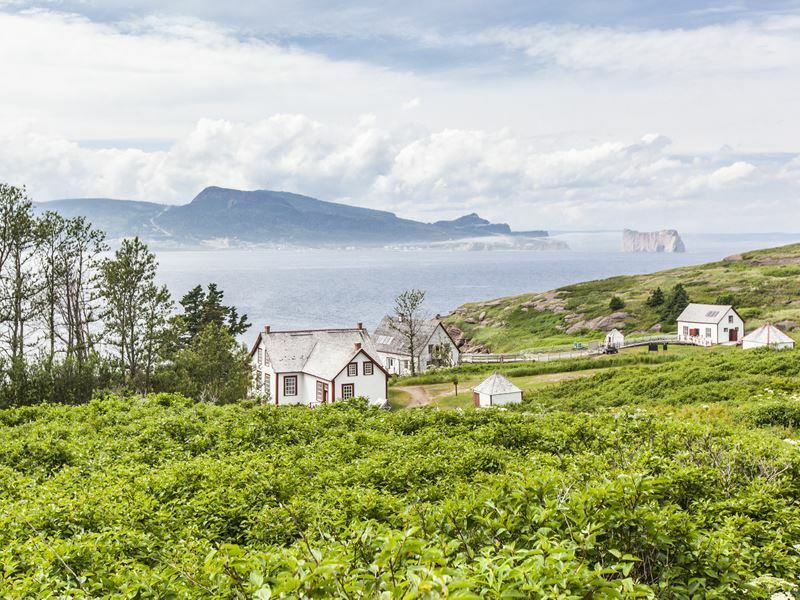 You’ll also get some great images from the 19th-century Presbyterian chapel located at the bottom of a bay in the tiny hamlet of Port-au-Persil. Few visit Montreal and Quebec City and skip a detour to Tadoussac. Located at the foot of a dramatic fjord on the northwest shore of the St. Lawrence River at its confluence with the Saguenay River, this historic little village (it celebrated its 400th anniversary in 2000) draws in the hordes for its incredible whale-watching from mid-May to mid-October. 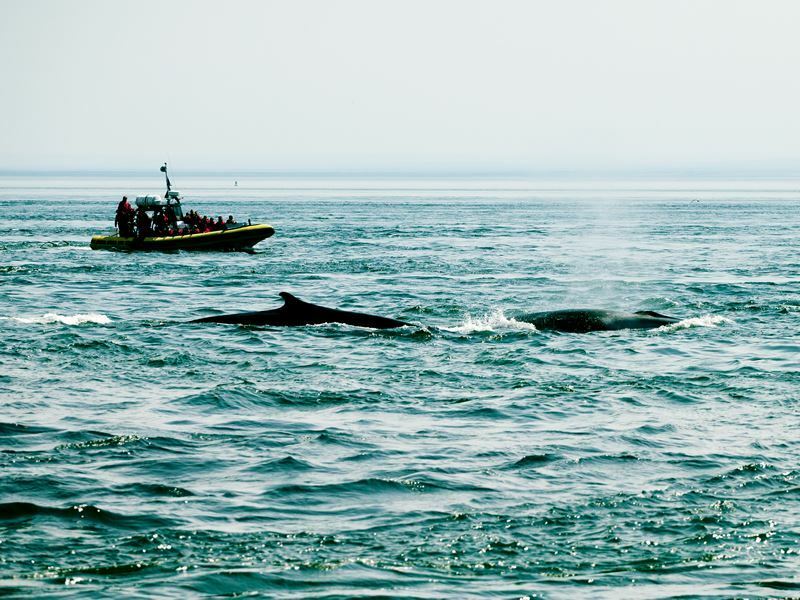 The 12-person zodiac boats and kayaks are easily the best way to get right up-close to these giant creatures (belugas, minke, fin, blue, humpbacks, long-finned pilot, and killer), but if you’re prone to seasickness, stick with a smooth catamaran or steady liner cruise. Alternatively, forgo the water and follow the 20-minute Pointe de l’Islet walking trail for superb shots without having to step offshore. Get the shot: Although most catamarans are kitted out with underwater cameras and TV screens, there’s nothing like watching whales slapping their tails and gliding along just below the surface with your own eyes. Be sure to set your ISO as high as you trust your camera to handle and increase your shutter speed, especially when encountering breaching whales. There’s plenty worth getting your camera out for in Mount Tremblant - the all-season outdoors playground carved out of the Laurentian mountain range. Just 80 miles north of Montreal, it’s one of the coolest spots for camera-carrying skiers and snowboarders - many of whom consider its 662 acres of skiable terrain among the best in eastern North America. Away from the slopes, crucial photo-worthy stops include Mont Tremblant National Park for its 400-plus lakes, sandy beaches, mountain peaks, and rich wildlife. 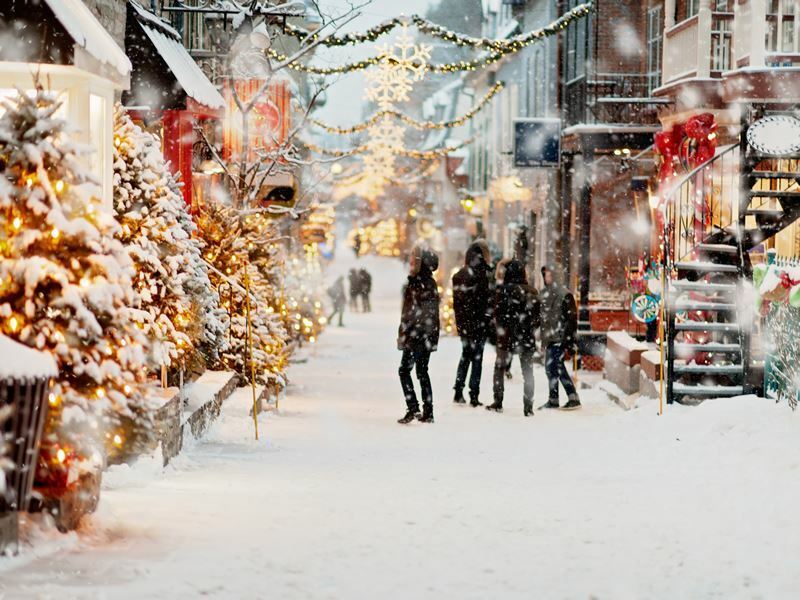 There’s also the quaint European-style village for its chalets, ancestral church, and train station turned art exhibition centre, and the enchanting ice rink around Chapelle St-Bernard for its nightly illuminations and seasonal activities. 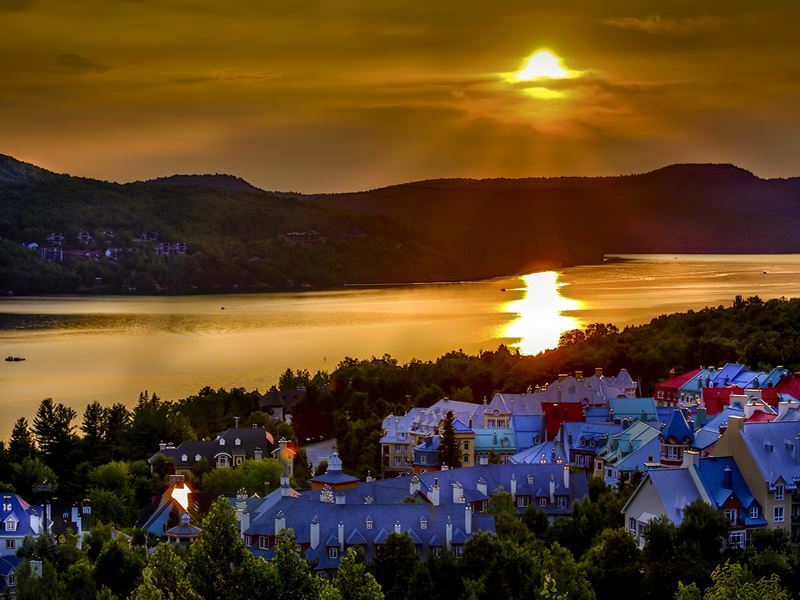 Get the shot: Get as close as you can to Mont Tremblant’s 2,871-foot summit for creative summer sunset shots of the alpine village (in the winter, the easy-to-access ski lifts definitely beat hiking). 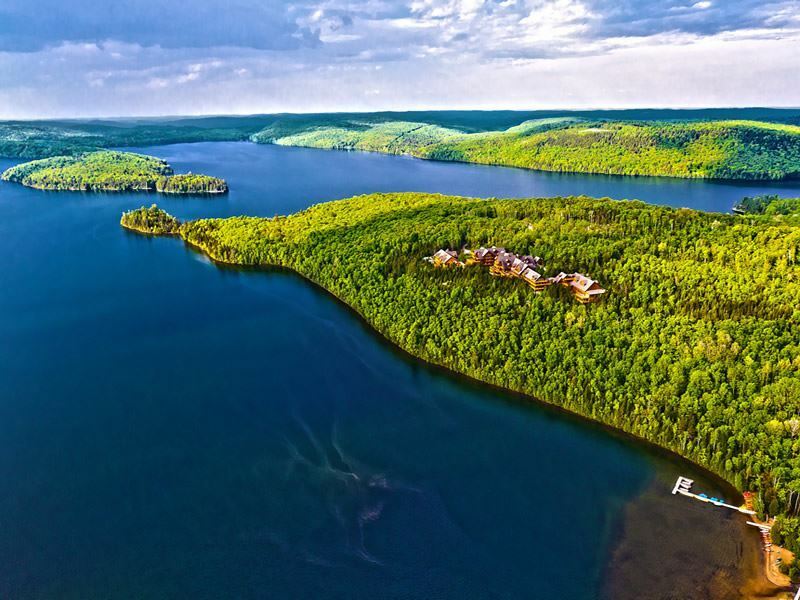 Alternatively, take a 10-minute helicopter flight over this iconic beauty and soar above the peaceful Lake Tremblant, the gentle Diable Rive, and the magical Laurentians. Given its 1,900 miles of coastline, Quebec is almost entirely surrounded by water: by Hudson Strait to the north, the St. Lawrence River and Gulf to the south, and James Bay and Hudson Bay to the west. Most wide-eyed photographers make a beeline for the province’s maritime regions (Eastern Quebec, Bas-Saint-Laurent, Gaspésie, Côte-Nord, and the Îles de la Madeleine) - all of which share a common bond with the sea and thrill with their own historical and cultural heritage. Highlights on a shore-clasping road trip include Gaspésie National Park for its 25 mountains over 3,300-feet-high, Anticosti Island for its 166,000 wild white-tailed deer, and Grands-Jardins National Park for its impact crater formed by a meteorite 360 million years ago. 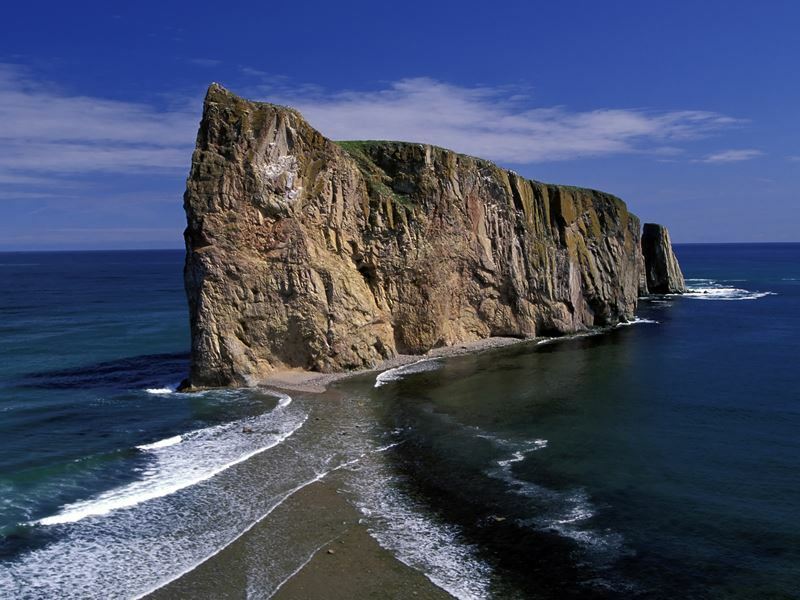 Get the shot: Located at the tip of the striking Gaspé Peninsula and accessed only by ferry, Bonaventure Island is one of the best places to photograph Rocher Percé (Pierced Rock). Rising dramatically from the Gulf of St. Lawrence like a stone cathedral (or as some say, a ship at sea), this 88-metre-high rock inspired many 19th century writers to enthuse about its beauty. Holding the Guinness record as the World’s Most Photographed Hotel, this UNESCO-listed grand dame (now owned by Fairmont Hotels & Resorts) stands tall on a cape overlooking the St. Lawrence River. Designed by American architect and innovator Bruce Price in 1883 as part of a series of luxury château-style hotels for the folk using the Canadian Pacific Railway, it was named after flamboyant French governor Louis de Buade, Count of Frontenac. 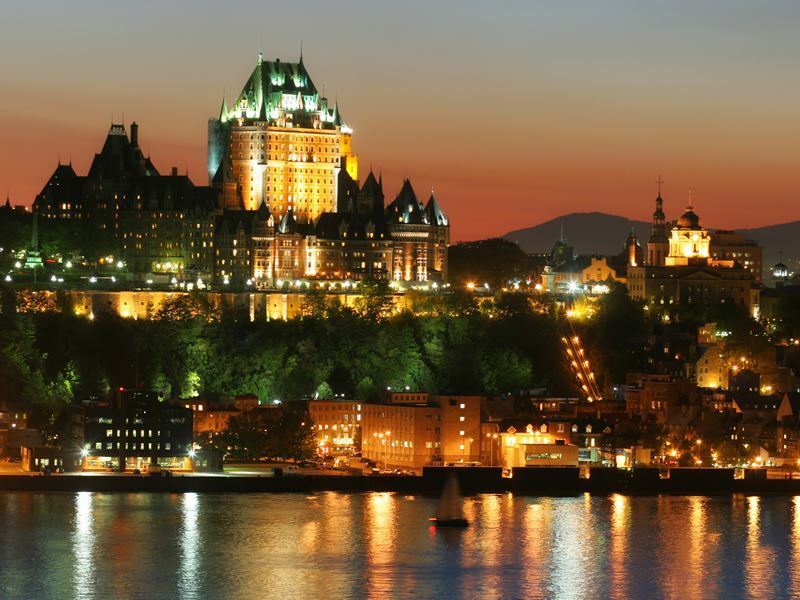 Even if you’re not planning on spending the night here (former illustrious guests have included King George VI, Elizabeth II, Franklin D. Roosevelt, Winston Churchill, Grace Kelly, and Alfred Hitchcock), there’s several places to score the perfect shot of Quebec City’s cherished fairytale-like icon. Get the shot: Capture this postcard-pretty landmark either from the top deck of the Quebec-Lévis ferry while in port at Lévis, along the tree-lined Rue Sainte-Anne, or at Pierre-Dugua-de Mons Terrace (preferably in first thing in the morning or early evening when it’s crowd-free). Another great spot is the south-west corner of Montmorency Park, past the Cartier monument. As summer draws to a close and autumn sweeps in, an explosion of brilliant colour throughout the province provides excellent foliage viewing. Some of the best places to capture this seasonal blaze of fiery reds, yellows, and oranges include the four Eastern Township’s national parks (Parc National de Frontenac, Parc National de la Yamaska, Parc National du Mont-Mégantic, and Parc National du Mont-Orford), and the ski resort of Monte-Sainte-Anne (the annual Great Colour Adventure festival from mid-September to mid-October is breathtaking). Further fantastic photo ops are in store around Mont Tremblant - especially during the Symphony of Colours festival (held every Saturday and Sunday from September through to the first week of October). Get the shot: During the autumn months, the fall foliage around the Laurentians is nothing short of spectacular. Head to this heavily forested wonderland in the morning or evening to film the thousands of maple trees and pine trees that change colour as the days grow shorter (try to avoid the middle of the day because the bright light ends up washing out the colour). Once home to 17th century artisans and rich merchants, this quaint, narrow, and much-loved Quebec City cobbled street ranks among one of the most beautiful in the world. Located at the foot of Cap Diamant, down the hill from the Château Frontenac, it’s lined with one-of-a-kind boutiques, upscale bistros, smart restaurants, speciality delicatessens, cosy cafés, and must-see landmarks. After photographing the three-dimensional mural (known as a trompe-l'œil) painted on the side of the building at No.102, turn your attention to the famous L’Escalier Casse-Cou (Breakneck Stairs) - the city’s oldest set of steps that link the upper and lower town that was built in 1635 but has been lovingly restored several times over the centuries. Get the shot: Covered with snow and illuminated by 15,000 twinkling light bulbs draped across the two- and three-storey stone buildings, winter along Rue du Petit-Champlain is simply magical. Just bear in mind that this place is a huge tourist trap (especially at Christmas time) so you’re likely to get the best pictures of the seasonal décor in the early morning or late evening. Quebec is home to more than half a million lakes (of which 30 have an area greater than 250-kilometres-squared) so it’s more than likely you’ll get your photographic fill. Some of the most picturesque bodies of water include Lac Saint-Jean in the Laurentian Highlands, Leamy Lake in Gatineau, Lake Brome in Montérégie, Wapizagonke Lake in Mauricie, Lac à l'Eau Claire in Saint-Alexis-des-Monts, and Lake Memphremagog on the Quebec-Vermont border. Also worth a visit is the Lake Manicouagan (also called Manicouagan Reservoir) - a ring-shaped hydroelectric lake that was shaped by an asteroid strike around 211 million years ago (it has a surface area of 481,856 acres and can be seen vividly from space). Get the shot: Just a two-hour drive from Montreal (or 30 minutes by seaplane), the Mastigouche Wildlife Reserve covers over 1,500-squared-kilometres of picture-perfect landscape studded with winding rivers and more than 400 lakes. One of its showstoppers is the pristine Lake Sacacomie whose heavily forested shore extends for over 42 kilometres. 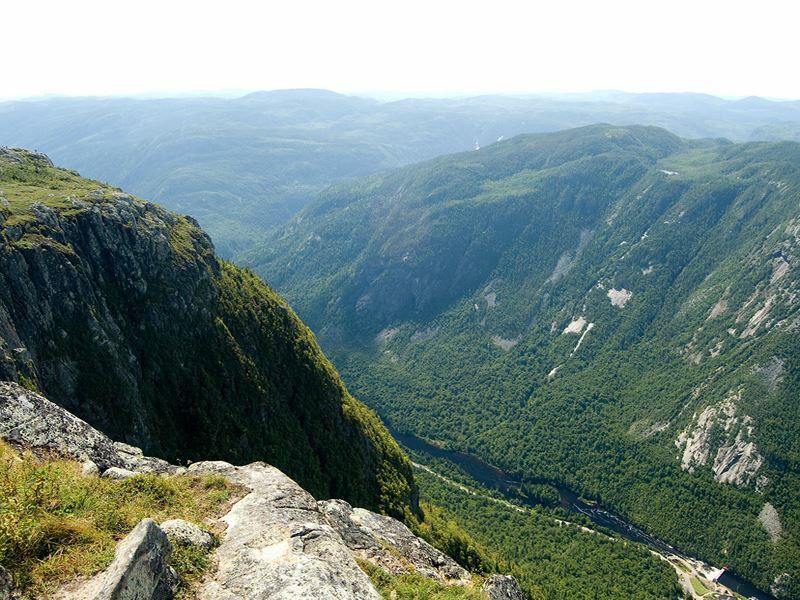 The Laurentian Mountains may get all the love, but Quebec has many prominent peaks for walkers and hikers to get excited about. For dizzying slopes, head to the 1,652-metre-high Mount D’Iberville at Kuururjuaq National Park, the 1,268-metre-high Mont Jacques-Cartier (also known as Tabletop for its flat summit) at Gaspésie National Park, and the four national parks in the Eastern Townships (Parc National de Frontenac, Parc National de la Yamaska, Parc National du Mont-Mégantic, and Parc National du Mont-Orford). 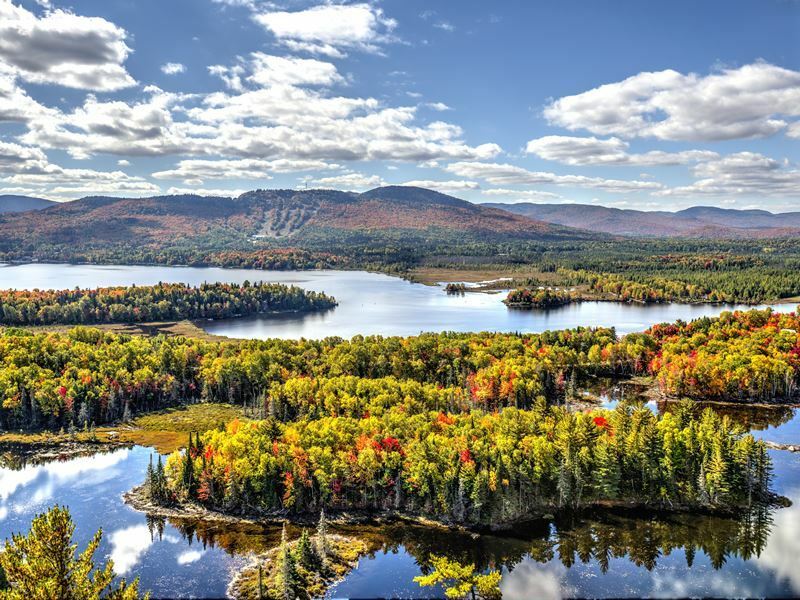 Equally rewarding is the 1179-metre-high Mont Gosford - the highest summit in the Appalachians that’s the centrepiece of a remote 15,000-acre ecological reserve located on the international border with Maine. Get the shot: Head to the hinterland jewel that is Malbaie River at Hautes-Gorges-de-la-Rivière-Malbaie National Park for incredible imagery of deeply carved gorges set against a mountainous backdrop. There’s also seven dedicated hiking trails, one of which gets you to the top of the Montagne des Érables (Maple Mountain) at 1,048-metres above sea level. For wide-eyed wildlife fans, Quebec really does have it all: 90 mammal species, 300 bird species (including the world’s most accessible Northern Gannet colony), and an extraordinary amount of zooplankton. Explore the forests for white-tailed deer, moose, caribou, black bear, and smaller critters like beavers, foxes, porcupines, raccoons, chipmunks, hares, and red squirrels - or head to the St. Lawrence Estuary to see thousands of snow geese making their way from the Great North to their winter habitat on the Atlantic seaside (usually in October). There’s also 13 species of whale found in the St. Lawrence River, including the beluga, minke, fin, blue, humpback, sperm, long-finned pilot, and killer. 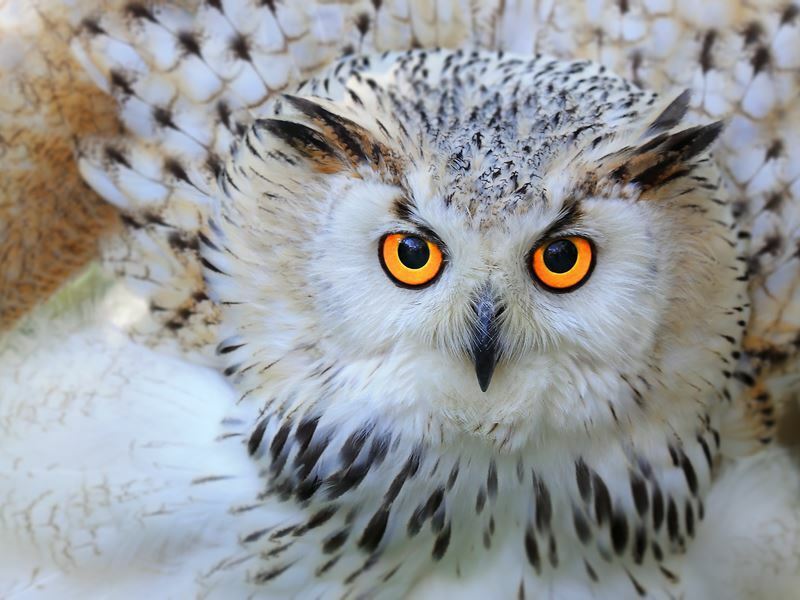 Get the shot: The official national bird of Quebec since 1987, the Snowy Owl (Nyctea scandiacais) is a yellow-eyed, white and black-spotted bird with no ear tufts. These so-called “White ghosts of the Great North” are best seen in the open, grassy fields nearby Montreal and Quebec City during the winter (in 2016, spectacular images of this gracious creature in flight were famously captured by Transport Quebec's CCTV camera along Montreal's Highway 40).